Exporter of a wide range of products which include abiraterone acetate tablets. Abiraterone Acetate Tablets work by reducing androgen production in the body. Androgens are male hormones that can promote tumor growth in the prostate gland. Zytiga is used together with prednisone to treat prostate cancer that has spread to other parts of the body. Abiraterone Acetate Tablets (abiraterone) work by reducing androgen production in the body. Androgens are male hormones that can promote tumor growth in the prostate gland. 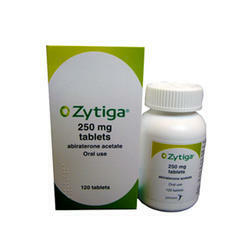 Zytiga is used together with prednisone to treat prostate cancer that has spread to other parts of the body.